Jack Delano visited the Chicago and North Western railroad’s locomotive backshop in December of 1942. 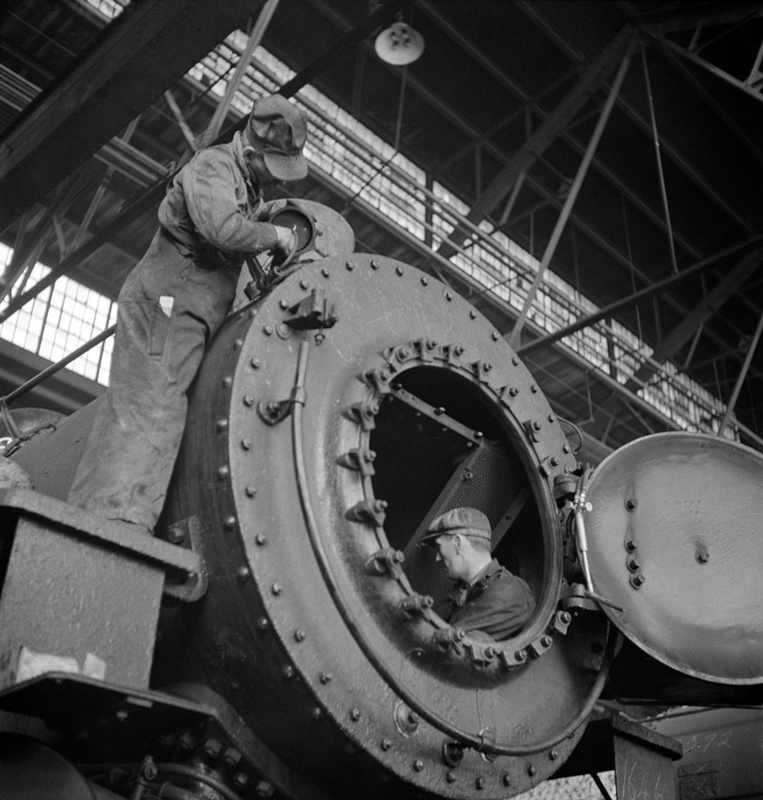 Shown here are a couple workers doing inspection and repairs to a steam locomotive. Opening the smokebox was an important part of the inspection, as it enabled the mechanic to see the tube ends for the boiler, as well as the exhaust components for the steam cylinders. The worker on the left appears to be an electrician performing some work on a class light. Great photo, Jack. Reminds me of an article in this month’s Running Extra that describes a model railroader’s journey from the current era to modeling 1927! It takes research and study of the era and the equipment to be able to do a convincing job. You are obviously a serious student of the idiom. Now, when will you get back to railroading? Now, when will you get back to railroading? Hopefully, in the near future, Matt. Thanks, Reminds me of a friend I saw in the tail of a Marshals small aircraft a few years ago. Guess if your small enough to fit. By the way,, did not watch Super Bowl,, but do NOT understand why Rams would try for 3 points and not a Hail Mary w/less than a minute! !